This past weekend somehow became Asian themed as far as dinner selections go, and it was glorious. We successfully created two dishes I’d been wanting to make for a while (but had been somewhat intimidated to try): bibimbap and sushi. The March issue of Cooking Light featured a recipe for Korean bibimbap in its “Everyday Vegetarian” section, and I was inspired to give it a shot. 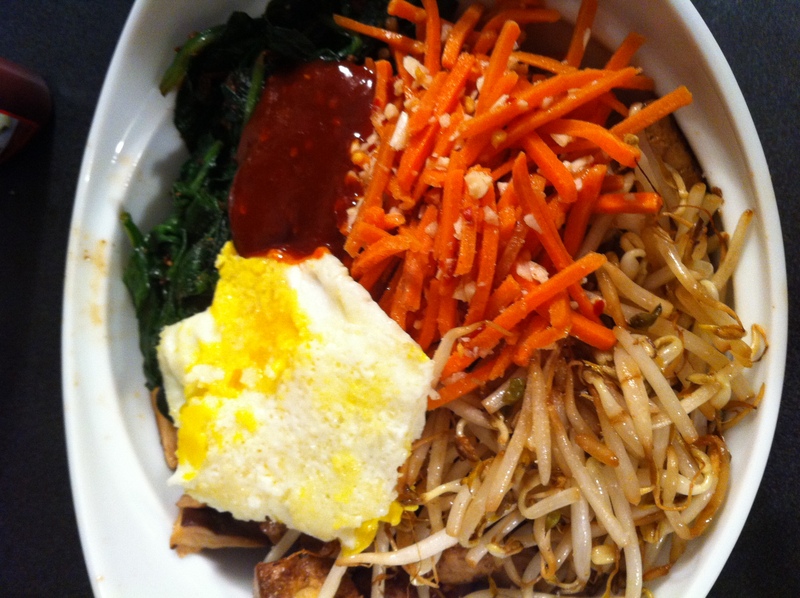 For those unfamiliar with the dish, bibimbap is one of the most common Korean meals, and it means “mixed rice.” It’s essentially rice topped with a variety of sauteed vegetables, a fried egg, chili pepper paste, and typically a protein (in this case, tofu). It’s a delicious, healthy meal, and I was thrilled to try it out in our kitchen. As it turned out, this was one of the most involved recipes Kevin and I have tried yet, with several steps that need to happen in quick succession. Since we were cooking together, though, and the meal prep was the focus of the night, it was a perfect dish for Friday. I wouldn’t recommend trying this one out unless you have a free evening and a helpful kitchen assistant. Note: The recipe calls for gochujang (Korean chili paste/”goes with anything” sauce), and it is AMAZING! (We got the Annie Chun’s version.) I have a feeling Kevin and I will start using this stuff on tons of dishes. 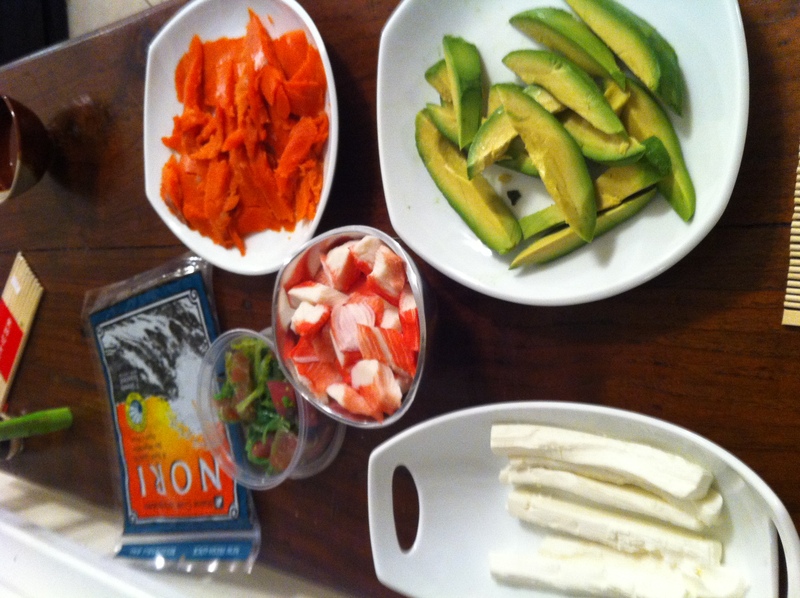 Next up: sushi night! The plans for this event originated while we were having dinner at Sushi Thai to celebrate Micheal Smith’s birthday last month (Micheal is one of my very favorite co-workers). In preparation for sushi night, Kevin and I visited both Whole Foods and Fresh Market yesterday afternoon, only to discover that Winston-Salem seems to be sadly devoid of sushi-grade fish (at least on a consistent basis). Our Whole Foods never carries it, and Fresh Market wasn’t getting another sushi-grade tuna delivery until Monday. Sigh. But we weren’t going to let that hold us down, and went the crab and smoked salmon route instead, also grabbing some cream cheese, avocado, and cucumber. (And then we found some seaweed salad with chunks of sushi-grade tuna in it that we were able to grab from the salad bar at Fresh Market. Score!) Wasabi, pickled ginger, sushi rice, nori, and sesame seeds: check! 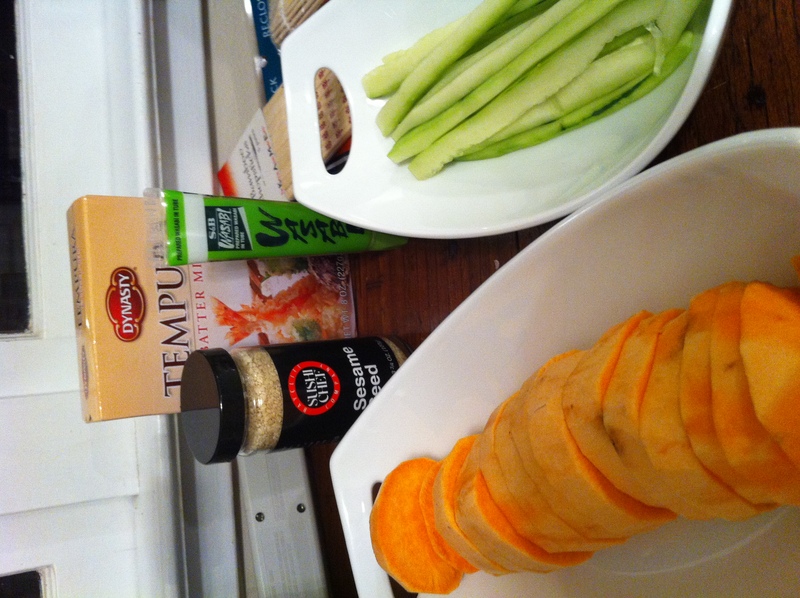 We’d bought some tempura batter a while back, and planned to use it on some sweet potatoes and green beans as an appetizer. Things were coming together. Micheal and I were new to the world of sushi rolling, but Kevin had previous experience, so he quickly became the sensei of the evening (and quite a good one, at that). We started off with some edamame and tempura veggies (SO tasty), and then got to rolling. 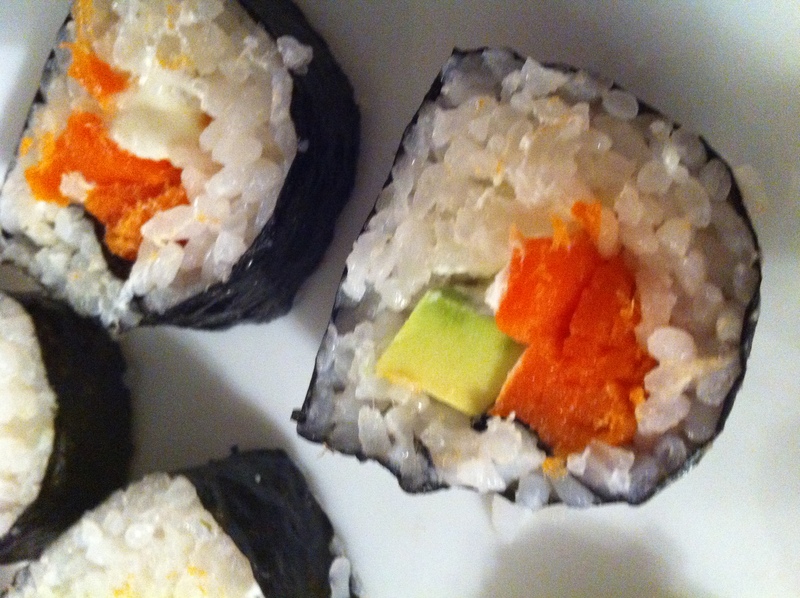 We put a thin layer of sushi rice on a sheet of nori, then just added ingredients that seemed to work well together (salmon, cream cheese, and avocado, for example) and rolled everything together, then sliced it up. As it turned out, we were good at this! 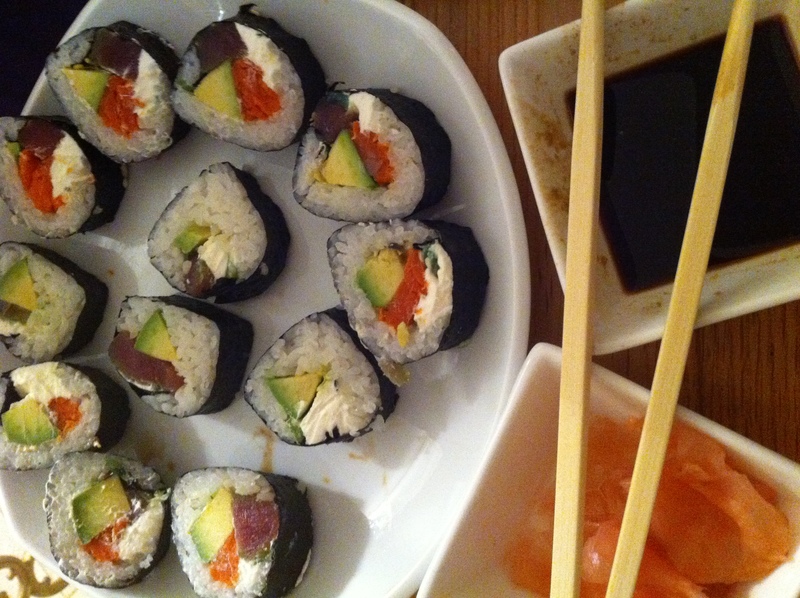 It was much easier than I’d expected, and I think homemade sushi will become a reoccurring meal option for Kevin and me. It was awesome having Micheal as part of our sushi-making team, too. Previous Previous post: Who Else Is An Oxford Comma Supporter? I’d love to learn how to make some of the Malaysian dishes we ate. (Maybe not nasi lemak, though.) If you find a good char kway teow recipe, share share share. Or a roti pisang recipe!